I'm trying my best but I can never hatch a melan. I'm gonna keep trying though. Hello, I am W.D.Gaster, but please, call me Lily. I want to collect lots of rare pokemon, but I'm not really caring about my rank too much. I am six hours behind PFQ time! 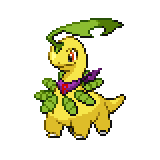 Made by Yay Bayleef sprite made by me not for your use. 17 is how many boxes I have for a BoxBox! 2 is how many I have! 39/1000 statues of all types for hunts. 680/500 For a hypermode voucher! You're loved and a wonderful person. Yep, it's empty. I have no idea why you hovered over this, but congratulations. I'm really looking for any amount of ZC I can get along with Daycare passes, hypermode vouchers, and Regi statues, anything for shiny chains. I'd really like to get a shiny luvdisc and sableye because they're my favorite pokemon.